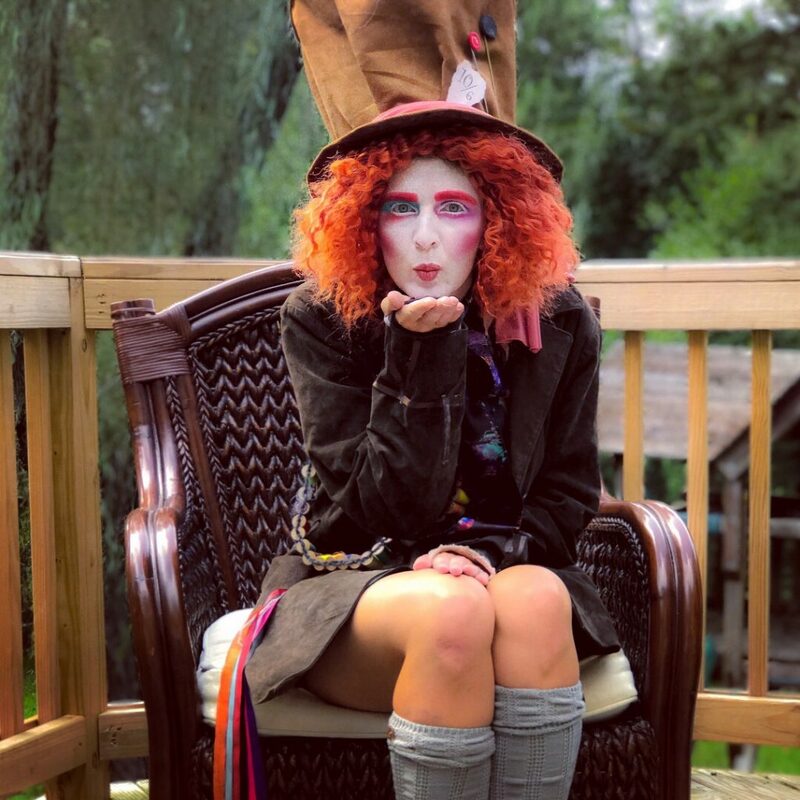 We’ve put together a quick tutorial on how to transform yourself into the Mad Hatter for a showstopping Halloween costume this fall. 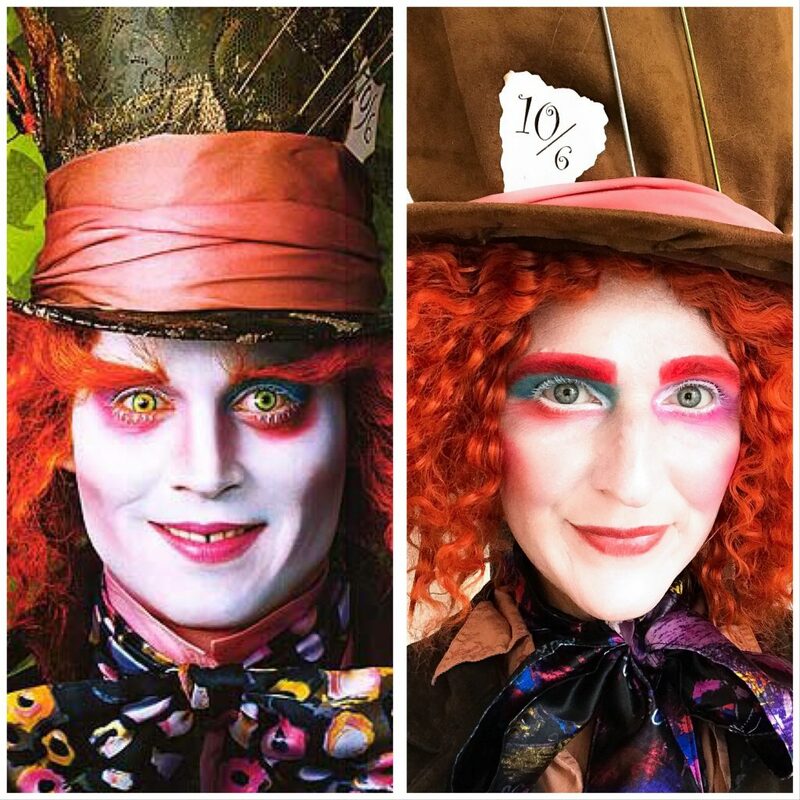 Let me begin by saying that i’m no professional… i know hard to believe .. HA 😉 But i wanted to share the steps I took to create this fun look. 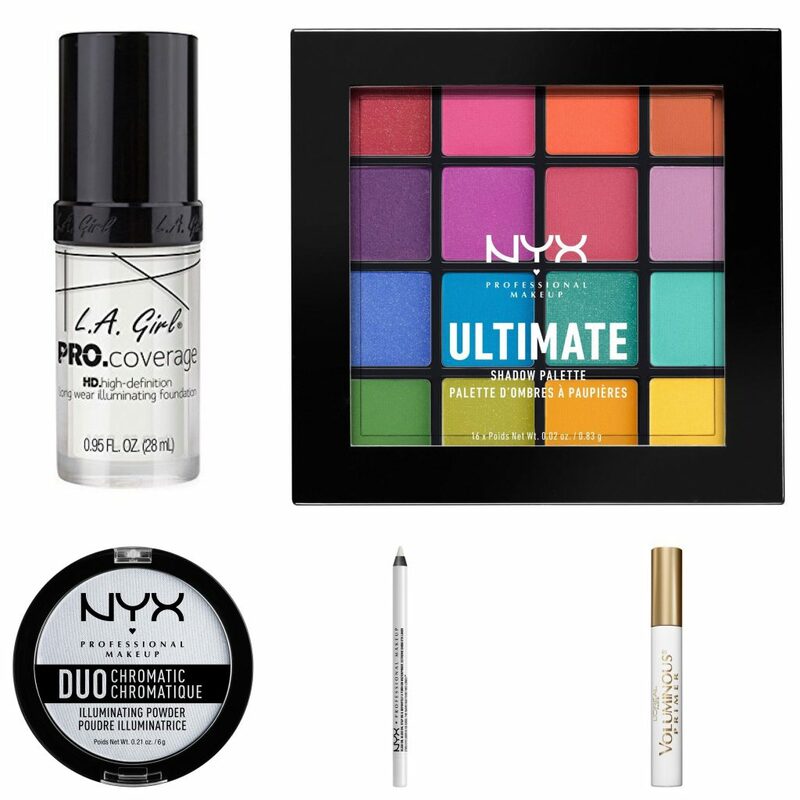 – Foundation and eyeshadow primers – I used what I had at home, any type will work. Start with a clean face. 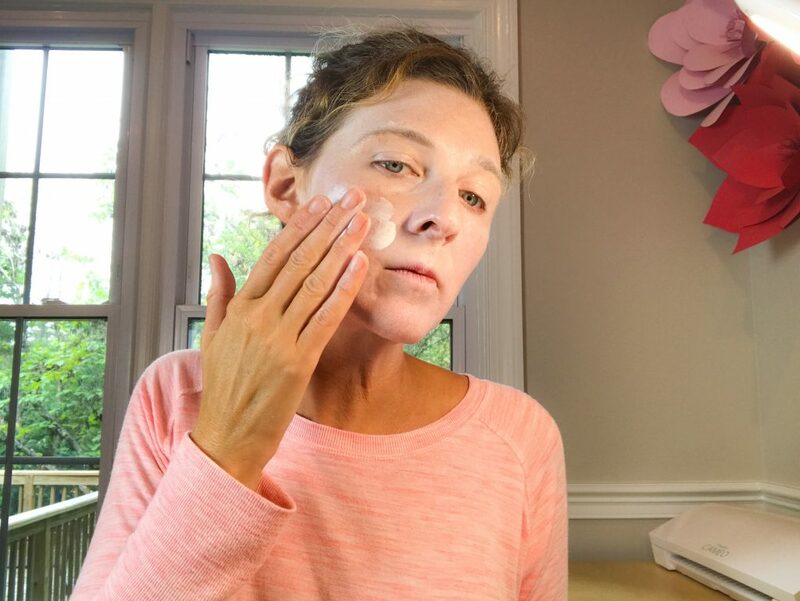 If you’re using foundation primer apply that first to face and neck. 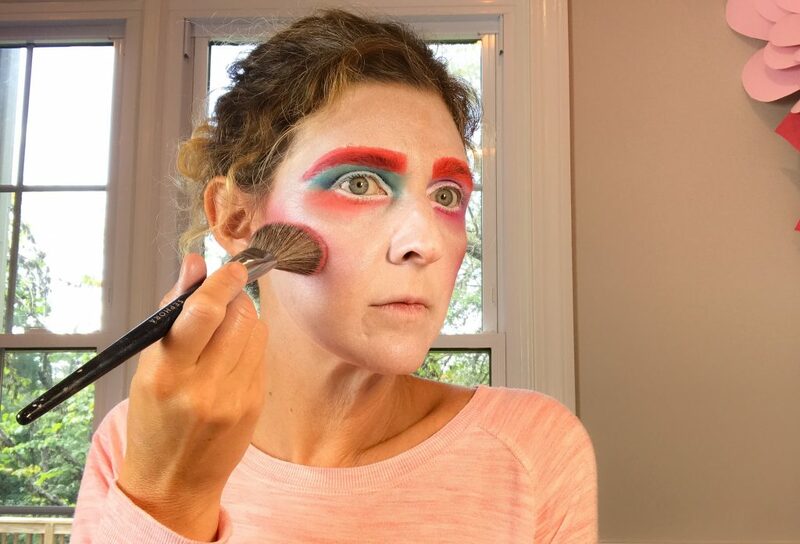 Apply the white foundation. I did several thin layers to get a brighter white color. 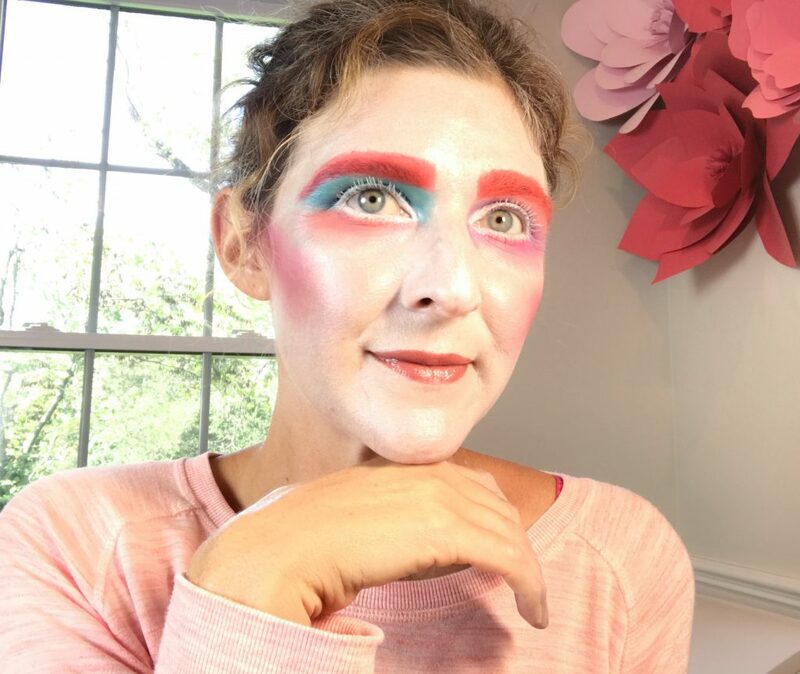 I applied the foundation to my eyelids too, but I would have been better off using a white or very light eyeshadow primer on my lids. 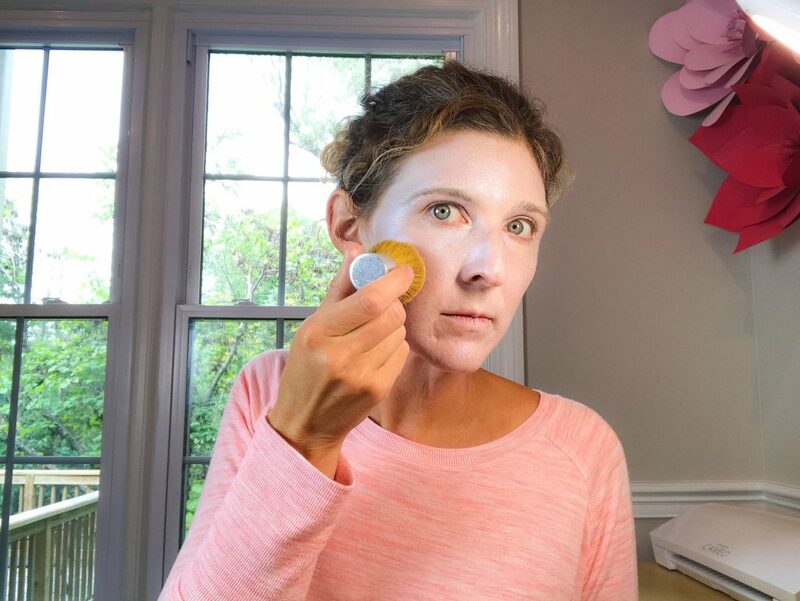 Use your white illuminating powder to “set” your foundation. Move in gentle circles around your face and under your eyes. Work in thin layers and build on them. It’s much easier to correct this way. Start with the lightest color and work to the darkest. Apply “1” under your brow. Then Add “2” to your entire lid. 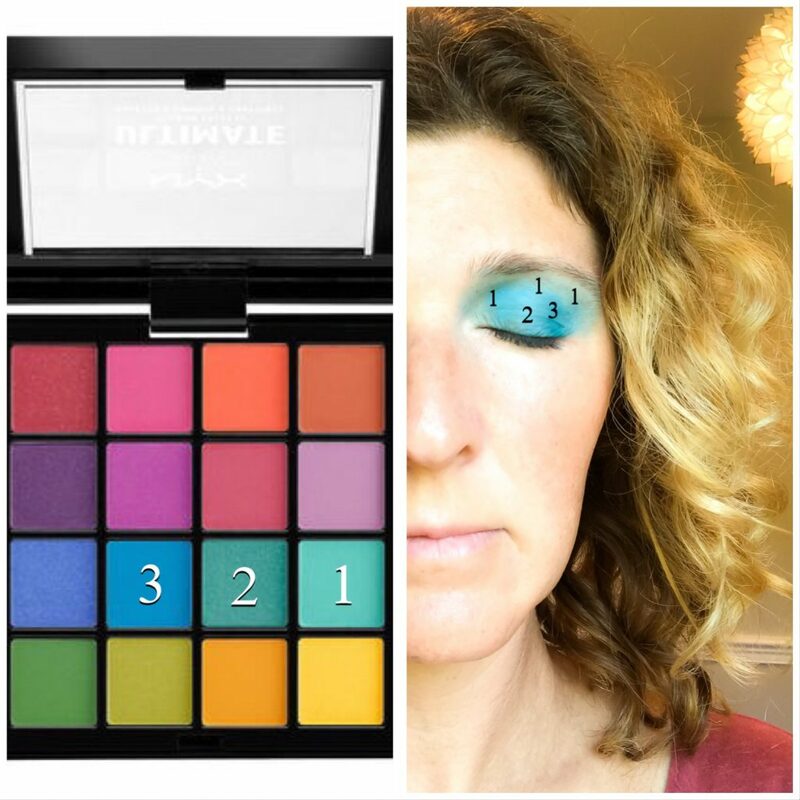 Add “3” to the crease and outer half of your lid. 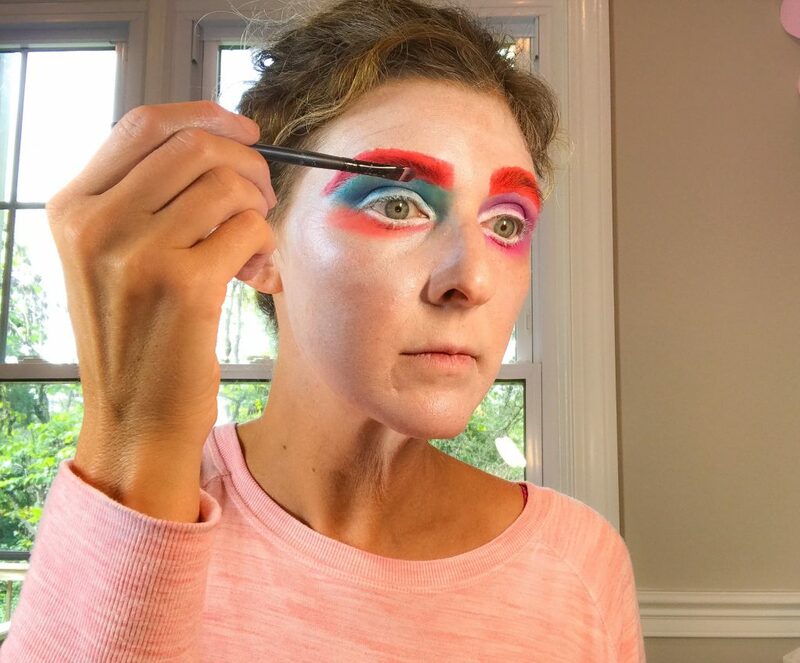 Using a blending brush (or any clean brush if you don’t have one, I don’t judge) blend where the colors meet sweeping the brush lightly to the inner corner of your eye. Add a little of the white chrome powder to the inner corner of your eye to make them pop. 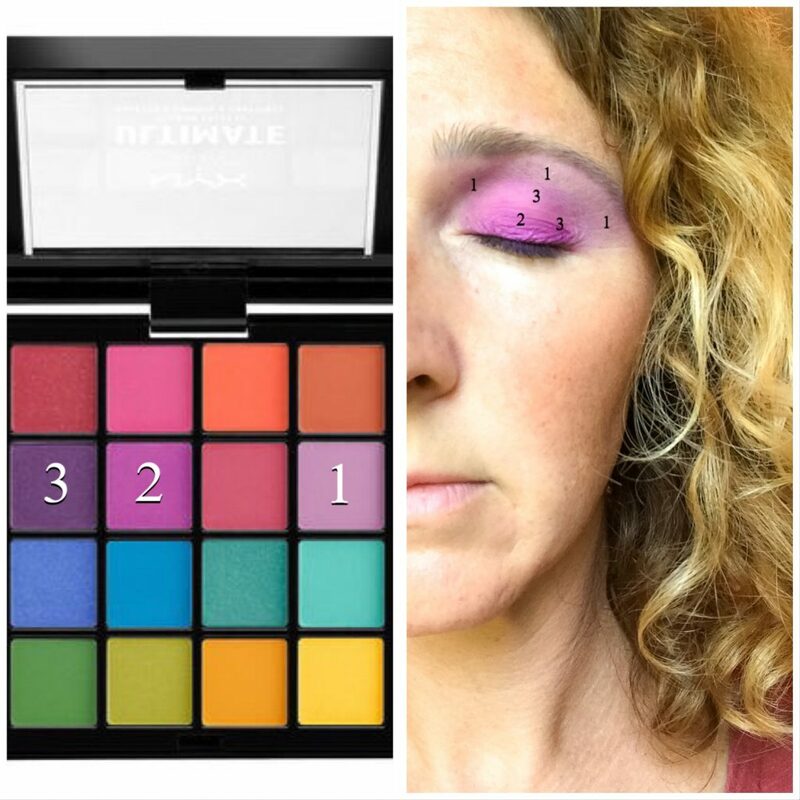 Repeat this step with the three pink and purple colors above on your other eye. Following the image above, use a small dry brush to apply a thin layer under each eye right below your lower lashes. 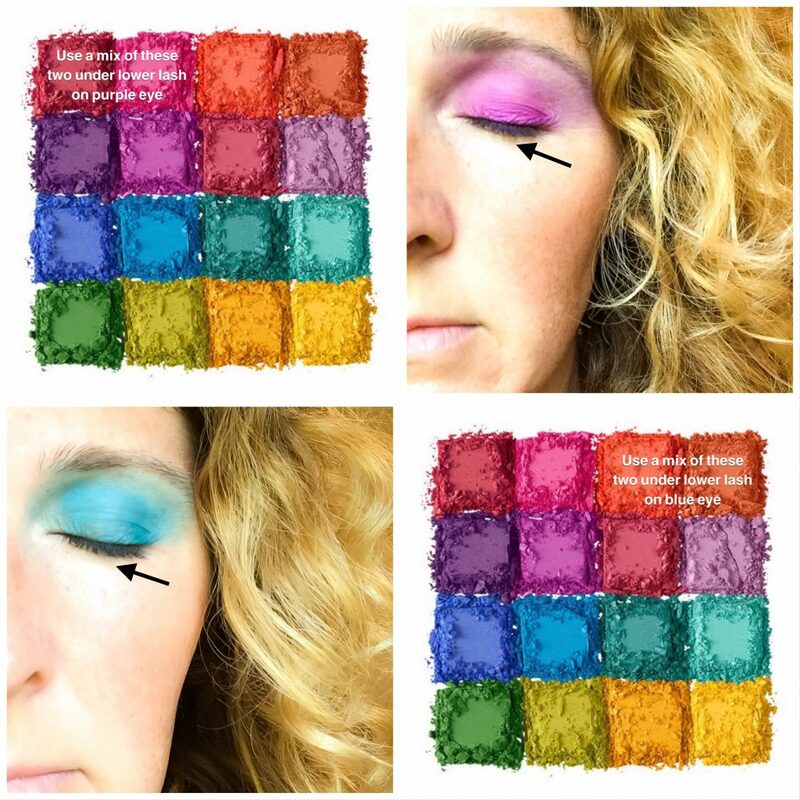 Use the two pink colors under your purple eye and the two orange colors under your blue eye. Use your white eyeliner to line both your top and bottom lashes. I covered my brows in the white mascara first. 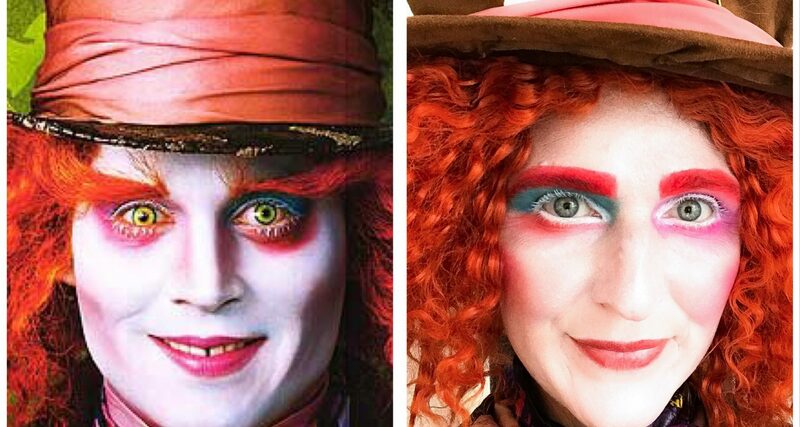 Not sure how much that made a difference, maybe additional eyeshadow primer would help create a better base for the orange brows. 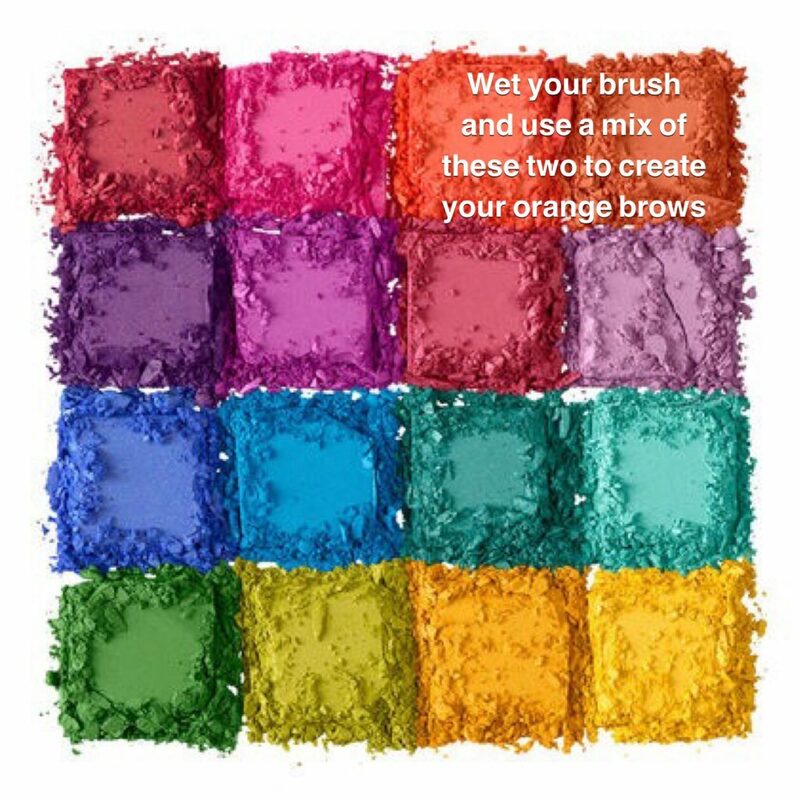 Wet your brush and combine the two orange colors shown above to create the Mad Hatter’s crazy brows. You could follow your own brow line or go a little larger. It’s a lot easier to start thin and go larger. Apply blush right along your cheekbones and a little below sweeping back toward your hairline. Apply your lipstick/gloss or both 😉 and your makeup is done! 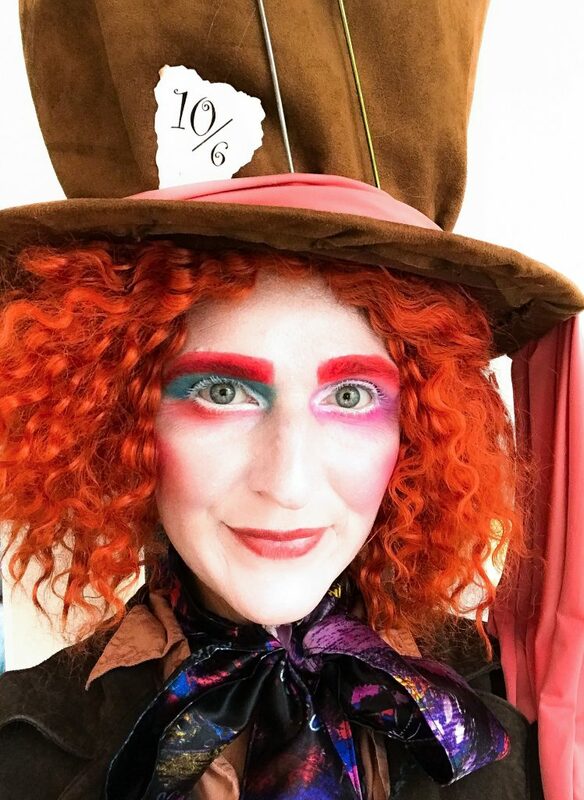 I purchased the wig a few years ago on Amazon – similar one found here. The hat we made following Threadbanger’s video tutorial. We made the thread bandolier using wooden spools that we wrapped in different colored thread and looped together with yarn. 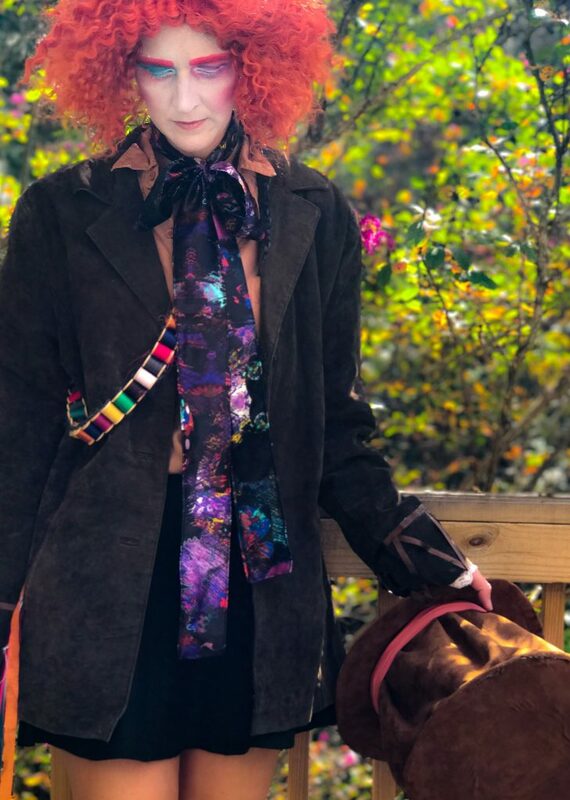 The rest of the costume was pieced together from items that we purchased at a thrift store.